Ever since Starbucks pulled the plug on its short-lived gluten-free baked goods venture back in 2009, no national coffee-shop chain has filled that void. That's about to change, as Dunkin' Donuts is test-marketing a gluten-free blueberry muffin (priced at $2.39) and cinnamon sugar donut ($1.89) and plans to roll out the sweets nationwide by Summer 2013, according to an operator of several stores in south Florida. 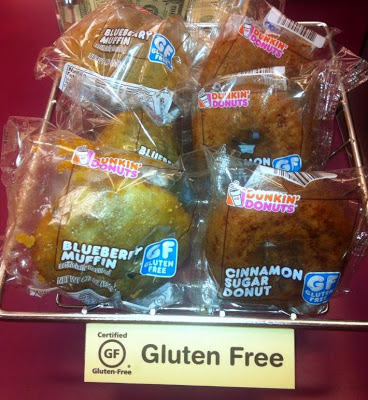 The packaged items, which are certified by the Gluten-Free Certification Organization, are being piloted at several Dunkin' Donuts locations in Miami and Boston. The company has more than 7,000 restaurants in 36 states and the District of Columbia. Florida franchisee Fred Guttenberg wrote on the Gluten Free South Florida Facebook page that "I am extremely proud to be able to offer this test. I have worked with Dunkin' Donuts on this ever since my son was diagnosed with Celiac Disease. This is an operations test only and limited to my two stores in Florida and a few locations in Boston. This will be moving to a larger test in February and full market roll-out closer to summer." According to Guttenberg, the baked goods have been in development for two years. The participating Miami stores are located at 12930 S.W. 120th St. and 10754 S.W. 24th St.; in the Boston area, locations at 1316 Beacon St. and 1008 Beacon St. in Brookline and 209 N. Harvard St. in Alston are carrying the products. 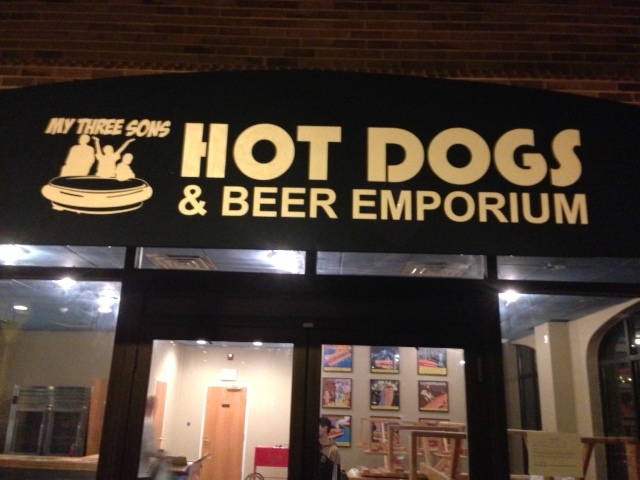 Haute hot dogs are the new gourmet hamburgers, it seems. Opening in Media at noon tomorrow is My Three Sons Hot Dogs & Beer Emporium (300 W. State St., 610-565-3674), where gluten-free buns and beer will be available. Every hot dog is themed and several are named after cities, reflecting each town's personality. The owners of Exton's Pronto have rechristened Ruffini's in Thorndale as Pronto Bistro Italiano (43 N. Bailey Rd., 610-380-8263), where they serve gluten-free pasta. Other items are designated on the menu. The reincarnated Ground Round, with an area location in Langhorne (735 Middletown Blvd., 215-757-2323) and another coming soon to East Windsor (529 Rt. 130 N.), notes gluten-free items on its dinner menu. McCoole's at the historic Red Lion Inn in Quakertown (4 S. Main St., 215-538-1776) notes gluten-free items on its menu, including pasta dishes. Also in Bucks County, Taormina's of Ivyland (880 Jacksonville Rd., 215-394-5523) serves separately prepared gluten-free pizza in a medium size. Thanks to reader Mike S. for the tips. Gluten-free pizza is available at Wingers in Folsom (1001 Macdade Blvd., 610-532-5080). The risotto dishes at That's Amore in Collingswood (690 Collings Ave., 856-869-5683) are gluten free, and other safe options from the Italian bistro are noted on the printed menu. Center City's Honeygrow (110 S. 16th St., 215-279-7724) has two new gluten-free stir-fry sauces: Coconut Curry and Lemon Miso Tahini. 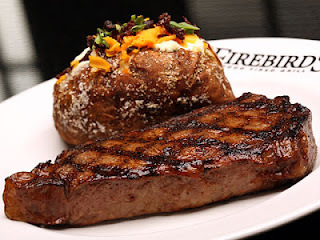 Firebirds Wood Fired Grill plans to open a new location at the Moorestown Mall in the summer of 2013. The American grill chain, with area spots in Chadds Ford, Collegeville and Newark, has a gluten-free menu. 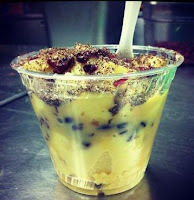 Raw-foods cafe JAR BAR has closed its Center City location on South 12th Street, but is still operating in Radnor. Food For All Market in Mt. Airy (7127 Germantown Ave., 267-297-7122) is now manufacturing and distributing its own line of gluten-free breads. CHOP's Children Celiac Support Group is planning a New Year's Eve celebration at Pasta Pomodoro in Voorhees (700 Haddonfield-Berlin Rd., 856-784-5647). Reservations are required from 9 p.m. to 11 p.m.; call the restaurant and also email the support group with the number of adults and children in the party. 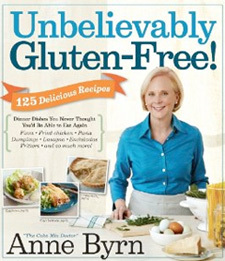 I want to extend my thanks to everyone for reading Gluten Free Philly this year and spreading the word about the blog. Please accept my sincere wishes for a Merry Christmas and happy and healthy 2013. In light of the tragedy in Newtown, writing about anything else at this moment seems inconsequential. As a father, my heart bleeds for the parents who sent their young sons and daughters off to school on Friday morning, never to see the wonderment in their children's eyes again, never to see their dreams realized. As a lawyer, I try to reconcile Americans' constitutional right to keep and bear arms with the ever-increasing number of crimes involving guns, particularly those that claim random lives like those in Newtown, Columbine and at Virginia Tech, to name just a few - a few too many. As I spent a couple hours yesterday morning driving to a meeting in northern New Jersey, I was flipping around the radio dial. Reporters talked about the New York Stock Exchange observing a moment of silence, that "Saturday Night Live" opened its most recent show with a youth choir singing "Silent Night." This just made me sadder. Then, I heard a report about an anonymous donor who, over the weekend, funded a gun buyback event in San Francisco and Oakland that took more than 600 guns off the streets - guns that surely weren't going to be used for sport. No doubt at least one child's life would be saved as a result. That someone with the financial means was willing to enact a gun-control measure of sorts was a welcome sliver of holiday cheer. I can only hope that those with political means are willing to take similar action. Near the famous Cowtown Rodeo in Pilesgrove, Salem County - the country's longest continuously running rodeo, by the way - is the Wagon Wheel Restaurant (1162 Rt. 40, 856-769-3200), which just debuted a gluten-free menu. The options include ravioli, stuffed shells, gnocchi, chicken parm and burger/sandwich buns. 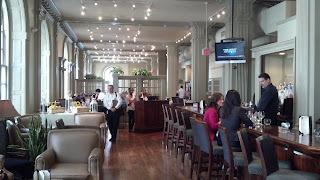 Teresa Caffe in downtown Princeton (23 Palmer Square E., 609-921-1974) has gluten-free penne. Nearby, New American bistro Patriots Crossing (1339 River Rd., 609-737-2780) can accommodate gluten-free guests. Thanks to reader Michele H. for the tip. Since there are so many Penn State students and alums in the Delaware Valley that travel to State College, I thought I'd pass along reader Matt B. 's heads-up that Original Italian Pizza in nearby Burnham (105 S. Logan Blvd., 717-242-0143) has gluten-free pizza, chicken tenders, fries, potato skins and salads. After more than 50 years in Trenton, the famed DeLorenzo's on Hamilton Avenue is moving out of the city. The owners, who serve Still Riding's gluten-free pizza, are relocating their shop to 147 Sloan Avenue in Hamilton Township early next year. Cheeseburger In Paradise has closed its Exton location, leaving the Newark, Delaware outpost as the only one in the area. The recently remodeled Acme market in Newtown Square (3590 West Chester Pike, 610-353-8018) has a dedicated Dietz & Watson gluten-free deli. Acme and other local markets are now carrying Bold Organics' gluten-free/dairy-free pizzas, which I reviewed in Tuesday's post. I've seen gluten-free tostada shells before, but recently spotted tostada bowls for the first time at the ShopRite on Evesham Road in Cherry Hill. Produced by Smokewood Foods under the Rio Rancho brand, the bowls are made with a blend of corn masa, navy bean and rice flours. Products from the all-gluten-free Amaranth Bakery in Lancaster are now available at the Marlton Whole Foods market (940 Rt. 73 N., 856-797-1115). Please thank the restaurants and bakeries featured on the blog's new "Where to Eat and Shop" page for supporting Gluten Free Philly by patronizing those businesses. Be sure to check back regularly for specials offered by them - right now, for example, diners can get $2 off a gluten-free pizza at The Tomato Bistro in Manayunk by mentioning or printing the listing. If you own a business listed on that page and would like more information on featured listings, please email me. While the only allergen I look for when buying food for my 12-year-old is gluten, avoidance of other ingredients - like milk, eggs and nuts - is equally important to many shoppers. Finding an tasty allergen-free frozen pizza is challenging, but a new product now fills that niche admirably. Bold Organics is a New York City operation run by Aaron Greenwald, whose idea for a gluten-free/dairy-free frozen pizza started in college. Greenwald collaborated with award-winning chef Eric Brenner to develop a line of four organic, allergen-friendly pizzas: Vegan Cheese, Veggie Lovers, Meat Lovers and Deluxe. The 11 oz. pizzas are free of gluten, milk, lactose, casein, whey, egg, peanut and tree nut products, and are sold at Acme Markets (I bought the Vegan Cheese there for $7.99; the others were one dollar more), Food Lion and natural foods stores throughout the tri-state area. Not being a vegan, I was skeptical of liking a cheese alternative - "cheeze," if you insist. I was impressed, however, with the Vegan Gourmet-brand faux mozzarella used by Bold on all of its pizzas. Although the imitation cheese wasn't spread evenly across the crust and didn't melt entirely, it was creamy. The crunchy base is made with a blend of potato starch, brown rice flour and yellow corn meal. The savory sauce made up for the absence of any additional toppings. With this combination of tasty ingredients, then, is there a downside? The nutrition facts on the box provide data for half a pizza and most people wouldn't be satisfied eating just that amount. Start laying on the pepperoni and sausage and the calories, sodium and fat content escalate significantly. On the plus side, an entire Vegan Cheese pizza satisfies about half of a day's recommended fiber intake. If I tried Bold's pizza without knowing it was dairy-free, I probably wouldn't have been able to make the distinction. That's the standard I often use in comparing gluten-free products to their traditional counterparts - and one I'm certain Bold Organics has aspired to meet. 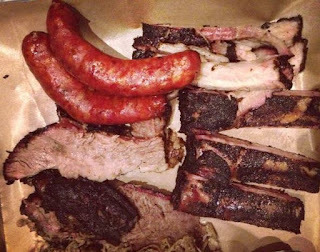 Fette Sau, named New York City's Best BBQ by Zagat voters since 2009, has set up shop in Fishtown (1208 Frankford Ave., 215-391-4888) as part of the Stephen Starr empire. All of the smoked meats are gluten free (the rub contains coffee, brown sugar, salt, cinnamon, garlic powder and black pepper), as are the potato and broccoli salads, baked beans, coleslaw, sauerkraut, pickles and all three table sauces. Old City Irish pub The Plough & The Stars (123 Chestnut St., 215-733-0300) notes gluten-free items on its menus, as does Mi Lah Vegetarian near Rittenhouse Square (218 S. 16th St., 215-732-8888). The Station Bistro in Kimberton (1300 Hares Hill Rd., 610-933-1147) serves gluten-free shrimp primavera at lunch and dinner, among other options noted on the menu. Also in the suburbs, Kennett Square's Bite of Italy (847 E. Baltimore Pike, 610-925-2762) offers gluten-free pasta and other options are listed on the menus. Previously on my "Where to Eat and Shop" list was Basil Leaf in Newtown (2808 S. Eagle Rd., 215-968-7505). The French-Vietnamese restaurant recently converted to a 100% gluten-free environment, so everything on the menu - from the spring rolls to the hoisin sauce - is safe. Basil Leaf is now part of GIG's Gluten-Free Restaurant Awareness Program. Mexican restaurant La Calaca Feliz is a welcome addition to Philadelphia's Fairmount section, as I wrote in Tuesday's review, with the fish and pulled pork tacos standing out. Reader Leah J. let me know that Camp Green Lane, an sleepaway camp in the foothills of the Poconos, can accommodate gluten-free campers. The kitchen at the Montgomery County camp, which runs a seven-week overnight session, has separate cookware, utensils and the like and serves comparable meals. Carlow Cookery in Doylestown (432 N. Main St., 215-489-2677) is hosting an intro-level gluten-free cooking class on Tuesday, February 5 at 7 p.m. On the menu is Pizza with San Marzano Tomatoes, Sausage and Caramelized Mushrooms; Stuffed Pork Chops with Apples and Mustard Glaze; Quinoa and Fennel Pilaf; and Chocolate Cake with Ganache Frosting. The class is $45 and online registration is available. Wegmans markets are now exclusively featuring gluten-free versions of European holiday favorites made by Schar: Panettone (Italian Christmas Cake), Chocolate Chip Panettone (Chocolate Chip Italian Christmas Cake), Fantasia (Yellow Cake), Cioccolini (Double Chocolate Cookies), Fior di Sole (Ring Cookies) and Spekulatius (Spiced Windmill Cookies). It was La Calaca Feliz (2321 Fairmount Ave., 215-787-9930) that we checked out on a recent Sunday night. Coming from the Garces universe, Spinner is well versed in gluten-free cooking. The majority of menu items are safe for those avoiding wheat. The freshly mixed Feliz Margarita, made with tequila from the bar well, was just what I needed after a long Thanksgiving weekend with my wife's relatives (Hi, sweetie! ), though it didn't call for too many sips. For the main course we shared an assortment of artfully plated tacos. The outstanding fish and pulled pork tacos more than offset the routine chicken. The lemon vinaigrette drizzled on the slivers of blue tilapia made the fish tacos particularly tangy. A side of brussels sprouts rounded out the filling meal. Modern Mexican restaurants have staked out a middle ground between no-frills South Philly taquerias and bland Tex-Mex chains. Though not at the top of the list, La Calaca Feliz is a welcome addition to that sweet spot. Town Center Boulevard in Voorhees is fast becoming Gluten-Free Restaurant Row. Joining the recently opened Catelli Duo outside the Voorhees Town Center (née Echelon Mall) is Rodizio Grill (13109 Town Center Blvd., 856-770-8300), a Brazilian steakhouse that's set to open on Tuesday, December 4. Nearly all of the proteins, sides and salad bar items are gluten free (as noted on the menu), including pao de queijo cheese bread. Opening in the spring along the same strip are gluten-free-friendly Iron Hill Brewery and Burger 21. 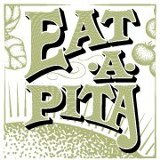 East of Market Street in Center City Philadelphia is Eat-A-Pita (128 S. 12 St., 215-925-7482), where guests can order sandwiches on Amaranth Bakery's gluten-free flatbread. Upon request, the sandwich maker will prepare the gluten-free order using ingredients from back-up bins. Soups and salads are also available. Foxfire, a New American BYOB at The Stone Barn in Kennett Square (550 Upland Rd., 610-347-2414), notes the gluten-free items on its farm-to-table lunch and dinner menus. At Shere-E-Punjab in Drexel Hill (5059 State Rd., 484-452-8140), Media (208 W. State St., 610-891-0400) and Glen Mills (301 Byers Dr., 484-841-6345), all of the gluten-free items (about 80 percent of the menu) are labeled. Thanks to reader Matt B. for the tip. Dessert's on at Center City's Pure Tacos (1935 Chestnut St., 215-496-9393) - flan served in a parfait cup with orange-infused dulce de leche sauce, dried cranberries and a house-made mocha-mole powder (made with coffee from Nook around the corner). The kitchen at the recently opened Growlers Bar in Bella Vista (736 S. 8th St., 267-519-3242) can accommodate gluten-free diets and usually has adult beverages on hand. Nearby, the former chef at GREAT Kitchens-trained Terra, Eric Paraskevas, is now working the stove at Bainbridge Street Barrel House (625-27 S. 6th St., 267-324-3553). Wegmans has added to its self-branded gluten-free product line with homestyle and blueberry waffles. The waffles come eight to a box and sell for $1.99 each, as compared to Van's version, which only come six per box and cost one dollar more there. As I wrote on Tuesday, you can find locally made Pure Gourmet premium sorbets and gelatos at Whole Foods and Giant markets throughout the Delaware Valley. Join the Chester County GIG chapter on Monday, December 3 at Floga Bistro, a BYOB in Kennett Square (826 E. Baltimore Pike, 610-444-6500), for dinner. (Arrive between 6 p.m. and 8 p.m. and mention that you are with GIG of Chester County; reservations aren't necessary.) Floga Bistro has an extensive gluten-free menu with pastas, pizzas, lava cake and more. Although French chef Georges Perrier is no longer in the kitchen at Philadelphia's famed Le Bec Fin, one of the desserts served during his tenure can still be enjoyed today. 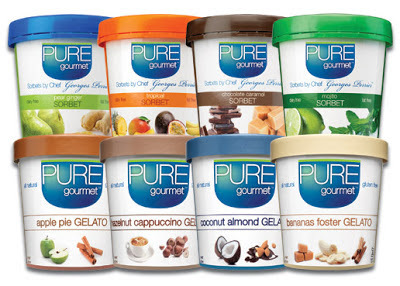 The chef's wife, Andrea Perrier, founded Pure Gourmet with two relatives in 2009 to create a retail version of the premium sorbets that were a part of the restaurant's lavish dessert menu. Today, the lineup includes Pear Ginger, Chocolate Caramel, Tropical (passion fruit, banana, mango and pineapple) and Mojito (lime and mint). The sorbets are accompanied by four varieties of gelato – Bananas Foster, Coconut Almond, Apple Pie and Hazelnut Cappuccino. "The sorbets are made from water and fruit, allowing the fruit’s succulent flavor to dominate, and the gelatos are made with only 10% milk fat, making them one of the healthiest on the market," says Perrier, a food industry veteran of more than 20 years who was formally trained and educated at the Philadelphia Restaurant School and in France. All flavors are gluten free and kosher and contain no hormones, artificial colors and flavors, or preservatives. Most of the sorbet flavors are fat free and dairy free. Pure Gourmet's all-natural sorbets and gelatos are available at more than 30 Giant retail locations across the Philadelphia region, more than 75 Whole Foods locations in the Eastern U.S. and a select number of independent markets in Delaware and other states. Not one, not two, but three Camden County Italian BYOBs are now catering to gluten-free guests. Tullia's in West Berlin (589 Rt. 73 N., 856-767-7761) has pizza and pasta and can adapt other menu items. In Voorhees, Viana's (300 White Horse Rd., 856-627-3800) offers pasta and can modify many dishes. Collingswood has yet another option in That's Amore (690 Haddon Ave., 856-869-5683), where items like risotto and polenta (which can be served with a variety of sauces) are marked on the menus. All of the kitchens are knowledgeable about safe preparation. Back in July, I mentioned that Burger 21 - a Florida burger-and-fries chain from the founders of The Melting Pot - is opening its first area location in Voorhees. I learned this week that it'll be joining the likes of Iron Hill Brewery and Catelli Duo on Town Center Boulevard, near what was once known as Echelon Mall, in Spring 2013. Burger 21 has an extensive gluten-free menu that includes burger buns, fries, salads and shakes. Speaking of the mall, Deux Au Naturel, which offered gluten-free wraps in the Voorhees Town Center food court, has closed. Reader Maori H. recommends The Mildred, a New American restaurant with a Continental influence in South Philadelphia (824 S. 8th St., 267-687-1600). With the opening of the Wursthaus Schmitz stand, there's finally a go-to option at Philadelphia's historic Reading Terminal Market (51 N. 12th St., 215-922-2317). All of the sausages and deli meats are gluten free, as well as the potato and cucumber salads and red cabbage. A couple weeks ago, I mentioned that Center City pan-Asian restaurant Aqua has a gluten-free menu. 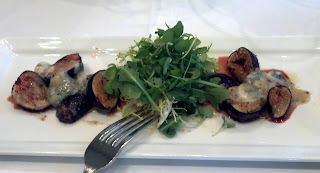 Contributing writer Alice reviewed a recent meal there in Tuesday's post. New to Elkins Park is CreekSide Co-op (7909 High School Rd., 215-557-4480), where gluten-free products are stocked and available by special order. Non-members are welcome. With apologies to the Eagles, the only area sports team in action these days is the Sixers. (If you don't believe me, read The Onion's funny-as-usual take.) Gluten-free items are sold at the Wells Fargo Center at the concession stand located in Section 122. Options include hot dogs, chicken sandwiches, nachos (no cheese), cookies and brownies, popcorn and peanuts, and beer and hard cider. All of the gluten-free-friendly restaurants, markets, caterers and attractions mentioned at these pages can be found at my new "Where to Eat and Shop" tab at the blog. There, you'll be able to sort listings by state and cuisine and get full contact information and weblinks. Hope you like it. I'm off next week but you can still keep up with Gluten Free Philly on Facebook and Twitter. Have a great weekend and wonderful holiday! On a recent cold Thursday night, my friend Sunny and I visited Center City Malaysian-Thai restaurant Aqua (705 Chestnut St., 215-928-2838) without reservations. We were surprised to find we were one of only three parties there. The lighting was rather bright, too, emphasizing the emptiness of the space. Happily, the food and service were a different story. We were greeted and seated immediately, and had drinks almost as quickly. The refreshing iced lychee drink I ordered was juice-like but lighter and less sugary. The gluten-free menu is a section of the traditional menu, so everyone receives it. As soon as our waitress saw us looking it over, she asked if we’d be ordering gluten free. She then confirmed this after each item we ordered, which I appreciated. We started with soups: I had the Tom Kha coconut soup and my friend ordered the Tom Yum lemongrass soup. He really enjoyed his, noting many layers of flavor, a little kick, and lots of vegetables. While mine was sweet and creamy, it was otherwise undistinguished. For the main course, Sunny ordered the Thai Basil Chicken while I went for the Mango Chicken. My dish was a bit spicier than I’d have liked (despite having asked for mild preparation) but was flavorful and was presented beautifully in a carved-out mango. Sunny also enjoyed his entrée, with crisp, bold flavors and basil in each bite. There wasn’t a ton of chicken in either dish, but we didn’t feel cheated. The true star of the meal was the fried rice. This is the one dish I miss most as a celiac, and Aqua’s version was pitch-perfect comfort food: a little greasy, a little salty, a lot of vegetables. It was a great complement to our spicier entrées. The only gluten-free option on the dessert menu was ice cream, but we passed since I am lactose intolerant. Given our other courses, we were too full to eat another bite anyway. Although we loved the food, the prices didn’t fit the casual atmosphere. Had Aqua been fancier, the expense would have felt right. Yet the fried rice is calling me back, so a return visit is in order. Alice Ozma is a young professional in the publishing industry. She lives in Old City and loves the adventure of finding good gluten-free food almost as much as the food itself. In Chadds Ford, Brandywine Prime (1617 Baltimore Pike, 610-388-8088) has a gluten-free menu that includes steaks, entrees, appetizers, salads and raw bar choices. At Fountain Restaurant, located at Center City's Four Seasons hotel (1 Logan Square, 215-963-1500), gluten-free items are noted on the menus. Miller's Ale House, with local spots in Northeast Philadelphia (9495 E. Roosevelt Blvd., 215-464-8349), Willow Grove (2300 Easton Rd., 215-657-0515), Langhorne (2250 E. Lincoln Hwy., 267-572-0750), and Mt. 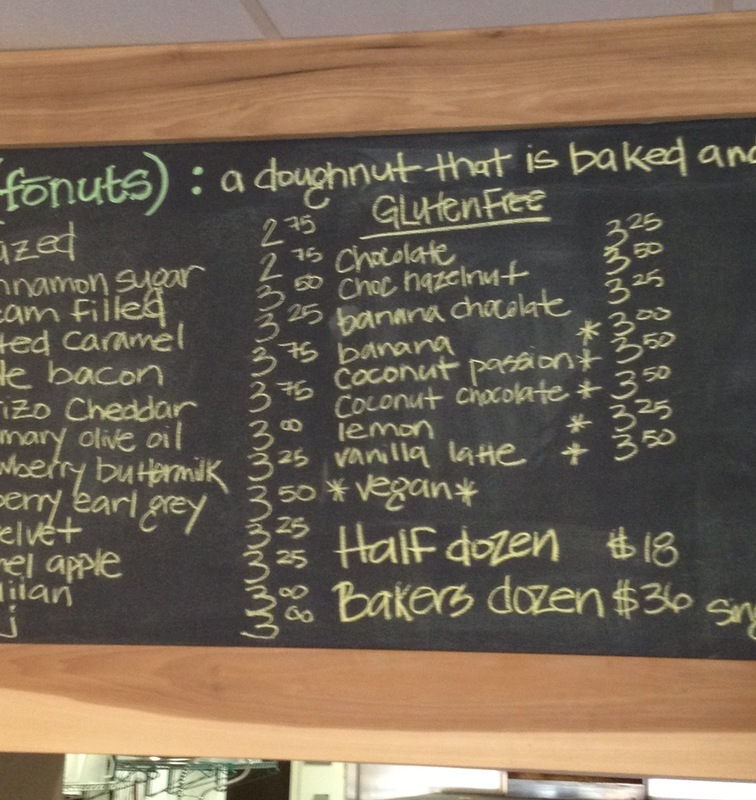 Laurel (554 Fellowship Rd., 856-722-5690), has updated its gluten-free menu, which now includes pizza. Also updating its gluten-free menu is Uno Chicago Grill, which has added Udi's gluten-free burger buns to go along with three kinds of pizza and other items. New items on the gluten-free menu at full-service Legal Sea Foods locations, such as the one in King of Prussia (680 W. Dekalb Pike, 610-265-5566), include fried fish-and-chips, shrimp, oysters, calamari and French fries. Not to be left behind, P.F. 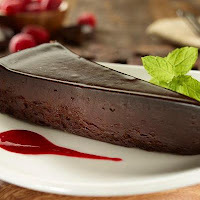 Chang's is adding new desserts to its menu starting next Wednesday, and this includes a flourless Chocolate Torte topped with a ganache and served with fresh mint and raspberry sauce. No word yet on whether this replaces the flourless chocolate dome currently on the menu. Pure Tacos in Center City (1935 Chestnut St., 215-496-9393) just introduced Taco Tuesday Social Networking specials with the limited-time Steakhouse Taco: achiote-marinated steak, topped with pepper-crusted mushrooms, house-made scallion cream, and crunchy, Cajun-spiced frizzled onions. Up next: a Thanksgiving-themed taco. Those who follow Pure Tacos on Facebook and Twitter will get word of the newest varieties. 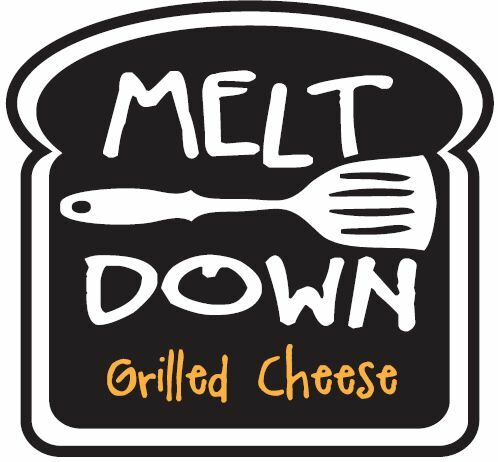 Melt Down Grilled Cheese is opening its newest location in Delaware, at the former Post House site in Newark (145 E. Main St.), on November 26. 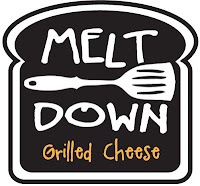 Like those in Wayne and Montgomeryville, the First State outpost will prepare grilled cheese sandwiches using gluten-free bread. The "Dishing With ..." segment returned on Tuesday with a Q-and-A with reporter Diana Rocco of CBS3 Eyewitness News. Read about how she manages eating gluten free on the road and her favorite restaurants in the city. The Little Bakery, the all-gluten-free bakery out of Blue Bell, will be sampling its products this weekend at B'tween Friendz in Dresher (today and Saturday), the Landis Supermarkets in Telford and Harleysville (Saturday) and Rittenhouse Market at 18th and Spruce in Philadelphia (Sunday). Sampling in New Jersey this weekend is PJ's Beef Steak. You can try the company's gluten-free beef steak slices and tenders this Saturday from 11 a.m. to 3 p.m. at the ShopRite on Evesham Road in Cherry Hill and at the Mt. Laurel ShopRite on Union Mill Road. On Sunday, PJ's will be sampling at the Marlton ShopRite and the Garden State Pavilion ShopRite, both on Route 70, during those same hours. As a reminder, there are two fundraising events next week to benefit the National Foundation for Celiac Awareness, one on each side of the Delaware River. Present the special voucher at dinner at the Chestnut Hill (Philadelphia) Iron Hill Brewery on Monday, November 12 and the restaurant will donate 20% of your food bill to the NFCA. Iron Hill has extensive gluten-free menus for adults and kids. 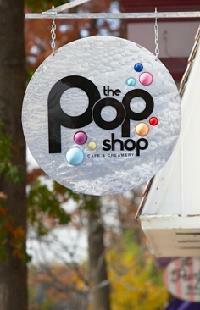 The Pop Shop in Collingswood will host a fundraiser on Thursday, November 15. When you bring this flyer and dine in for any meal that day (8 a.m. to 9 p.m.), the restaurant will donate 15% of your total check to the NFCA. The Children’s Celiac Support Group's next meeting will be on November 18 from noon to 2 p.m. at the CHOP Specialty Care Center in Voorhees. Children of all ages are welcome. Each family is asked to bring a gluten-free Thanksgiving dish and recipe to share. RSVP by November 15 via email or by calling 215-590-2985. For those who live or work near Medford, Raynor Electric is coordinating a donation drive (food and personal items) all this month for those affected by Storm Sandy. Gluten-free food is welcome. Wow, that's a lot of info for one week. Enjoy what should be a relatively mild weather weekend! I'm in the running for Writer of the Year at the Philadelphia-area food-and-wine blog Epikur. Please vote for me, Michael, with much thanks. No registration or login required to vote. While Diana Rocco is a newcomer to Philadelphia, she's no stranger to the news. Before joining the CBS3 Eyewitness News team as a general-assignment reporter in February 2012, the award-winning journalist reported for stations in Boston, Washington, D.C. and New York. In this "Dishing With..." segment, she talks about how she manages to eat gluten free on the road, her favorite places to eat, and how Philadelphia compares to other cities when it comes to gluten-free options. I was medically diagnosed in November 2005. I actually diagnosed myself after reading an article in Self magazine about celiac disease. I had never heard of it before but as I read the list of symptoms realized that I had nearly all of them. I knew I hadn't been feeling well but had learned to live that way and dismissed the symptoms as job stress. As a general-assignment reporter, you're called on to travel throughout the Delaware Valley. How do you manage your diet on the road? I try to always bring my lunch or dinner to work or at least a snack. I never know where I'm going to end up and if there will be a gluten-free option available for me. On the days I do find myself stuck, I'll usually pop in a grocery store and get some veggies and hummus - that's always safe. I've found Wawa can be a huge help when I'm in a jam. They always have pre-packaged veggies, cheese sticks, eggs and Greek yogurt. Have you had to change anything about your lifestyle since your diagnosis? Everything has changed! I lead a very normal life but my approach to my health is so much different. I didn't know how sick I was until I went gluten free and started feeling well again. I had more energy and I found it even affected my mood. It was like a fog had lifted and the world went from black and white to color again. I exercise more now; I cook more; I take more time preparing my foods. I'm definitely a label reader. I'm not afraid to ask questions at restaurants. I have a different outlook on life and I think I'm an overall happier person to be around. How does Philadelphia compare to other cities you've worked in with the amount of gluten-free options available? Philadelphia is the best! In fact, Gluten Free Philly is one of the things that sets Philadelphia apart from other cities. Starting a new job in a new place can be tough and this is an amazing resource when you don't know where to start. New York and Boston definitely have gluten-free options but restaurants are not as well-versed as they are in Philadelphia. I was surprised with just how many restaurants have gluten-free menus and how many options I had. There are so many gluten-free bakeries and even entire cafes dedicated to gluten free that I don't feel I miss out on anything I once took for granted. I love to cook. Sauce is one of my favorite things to make, and for the most part it's naturally gluten free. I also love making pizza at home, but you can't do that every night so I usually keep it simple with grilled chicken, veggies and quinoa. Quinoa is quickly becoming one of my staples. Where are some of your favorite places to dine out? Amada has to be one of my favorite restaurants in the city. I'm a big sushi person and I love Zama too. Whenever I have friends or family visiting from out of town, I make sure we stop at one or both of them. I've also found Pure Fare to be a great resource when I need to grab a pre-made meal on the run. Pure Fare is all gluten free and they have some wonderful desserts. Have you had time to explore Philadelphia since you started at Eyewitness News? I've spend a few weekends walking around the city exploring. I love the Art Museum area - it reminds me a lot of D.C. The Barnes Museum is one of my favorites. The farmers' market on Rittenhouse Square on Saturdays has also become a regular weekend destination for me. I love that I have the ability to impact people's lives. I really enjoy getting to know people and to hear and tell their stories; if you can help someone in the process then it's a rewarding and fulfilling day. It's a privilege to be able to serve my community in that way. I enjoy going to work and seeing where each day takes me, and I know every day is going to be different. It's never boring! When did you develop an interest in becoming a journalist? I've always been interested in the news and had a general curiosity about the world around me. From the time I entered high school, I knew this is what I wanted to do. I saw it as a way to make a difference in people's lives. Have parts of your job changed since the Internet has essentially created a 24/7 news cycle? In the 10 years I've been in this business it has changed immensely. Information is much more rapidly available and changing by the minute, so there is more pressure to stay up on it. There are also more avenues to get information. Five years ago, I didn't even know what Twitter was; now I'm tweeting more than I ever thought I would and staying on top of other people's tweets to make sure I don't miss a thing. What was it like to emcee Appetite for Awareness? It was an honor and a pleasure. I had so much fun! It was really amazing to see so many people in one place bringing awareness to a cause that has impacted my life so greatly. Aqua, a Malaysian and Thai restaurant on the east side of Broad Street in Center City Philadelphia (705 Chestnut St., 215-928-2838), has a gluten-free menu that features several noodle dishes. The owner, Vickie Chung, is familiar with appropriate food preparation. Marrone's Pizzeria in Ardmore (2744 E. County Line Rd., 610-642-9567) now serves gluten-free pizza using Still Riding's crusts. Also with gluten-free pizza is Fino's Pizza in Philly's Germantown section (6784 Germantown Pike, 215-844-1188). Reader Samantha M. let me know that Collingswood's Indiya (612 Haddon Ave., 856-858-0020) lists gluten-free options on its menu. The newest featured dish from Pei Wei Asian Diner, Sriracha Chicken, is gluten free, as is the version made with shrimp. The Bards Irish Bar near Rittenhouse Square has discontinued its gluten-free menu, at least for now. New at Trader Joe's markets is a gluten-free three-cheese pizza with Roma tomatoes. The 11-oz. pie is made on a rice-flour crust with provolone, mozzarella and Manchego cheeses and sells for $4.99. In the freezer case at most other markets is a new line of breakfast bakes from Bob Evans. The three microwaveable varieties - sausage, egg and cheese, bacon, egg and cheese, and meatless Southwest - are mixed with hash browns and are baked, not fried. In case you missed it due the storm, on Tuesday I announced a Goodies Giveaway for dinner at The Pop Shop in Collingswood. The prize includes dinner entrees for four guests. (The Pop Shop has gluten-free grilled cheese, chicken fingers, fries and more.) You can enter here now through Sunday. Speaking of The Pop Shop, the restaurant will host a fundraiser to benefit the National Foundation for Celiac Awareness on Thursday, November 15. When you bring this flyer and dine in for any meal that day (8 a.m. to 9 p.m.), the restaurant will donate 15% of your total check to the NFCA. Also on the calendar is a fundraiser at the Iron Hill Brewery in the Chestnut Hill section of Philadelphia. Present the special voucher at dinner on Monday, November 12 and the restaurant will donate 20% of your food bill to the NFCA. Iron Hill has extensive gluten-free menus for adults and kids. This being election season, I'm in the running for Writer of the Year at the Philadelphia-area food-and-wine blog Epikur. Please vote for me at this page, with much thanks. No registration or login required to vote - just three mouse clicks and you're done. Collingswood, New Jersey is home to many gluten-free-friendly restaurants and bakeries, but perhaps none more family-friendly than The Pop Shop (729 Haddon Ave., 856-869-0911). Owners Connie and Bill "Stink" Fisher, both South Jersey natives, added gluten-free bread to the menu at their retro-style diner a few years ago for their signature grilled cheese sandwiches (Stink once bested celebrity chef Bobby Flay on an episode of Food Network's Throwdown with "The Calvert"), and have since begun offering chicken fingers and fries (made in a dedicated fryer), French toast, ice cream cones and cupcakes. Known for their community involvement, The Pop Shop is hosting a fundraiser to benefit the National Foundation for Celiac Awareness on Thursday, November 15. When you bring this flyer and dine in for any meal that day (8 a.m. to 9 p.m.), the restaurant will donate 15% of your total check to the NFCA. To enter up to three different ways, follow the instructions below. Entries are being accepted through Sunday, November 4. You must enter a valid email address so that I can contact you if you're the winner. In Old City Philadelphia, Spasso Italian Grill (34 S. Front St., 215-592-7661) offers gluten-free pasta that is prepared in new water in a clean pot. 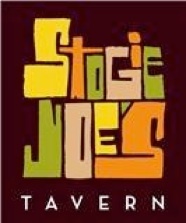 Reader Anna A. recommends the baby-back ribs and sausage bites at Stogie Joe's Tavern in South Philadelphia (1802 E. Passyunk Ave., 215-463-3030). The owner is familiar with gluten-free options on the menu. Also recommended, from Molly K., is Talula's Garden, the highly regarded farm-to-table New American spot in Philadelphia's Washington West section (210 W. Washington Square, 215-592-7787). Most of the menu is either naturally gluten free or can be adapted, and gluten-free bread is available with notice. I finished my southern California Road Trip series in Tuesday's post, with the last segment covering Los Angeles and Santa Monica. The Chester County chapter of the Gluten Intolerance Group is GIG hosting “Gluten-Free: Out and About” on Monday, November 12 at Wegmans in Downingtown (1056 E. Lancaster Ave.) from 6:30 p.m. to 8 p.m. Schӓr USA's Director of Nutritional Services, Anne Roland Lee, will be speaking there, and there'll be food samples, a tour of the store's Nature Marketplace section, as well as tips and resources for dining out and traveling. RSVP is not required. As always, have a great weekend! As famous California roadways go, the Pacific Coast Highway is a top-five candidate. Otherwise known as State Route 1, the famous road runs along much of the coastline and connects the northern San Francisco Bay Area to the southern part of the state. One magnificent stretch runs through Malibu, where we had dinner our first night in metro Los Angeles. Our place of choice was Duke's Malibu, an offshoot of the Duke's family of restaurants well known in Hawaii, where we were able to get an ocean-view booth. Duke's has a gluten-free menu, off which our son ordered a Rocket Salad (arugula, Maui onion, bacon, roasted beets, goat cheese, white balsamic vinaigrette) and ono (also known as wahoo) glazed with a chili and cumin aioli with white rice and black bean salsa as sides. Before returning to the Sheraton Delfina for the evening, we drove down another famous highway, Wilshire Boulevard, to get dessert at Beachy Cream in Santa Monica. 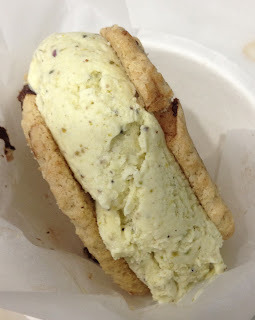 Not just any dessert, mind you, but a homemade ice cream sandwich - two gluten-free chocolate chip cookies with pistachio ice cream. 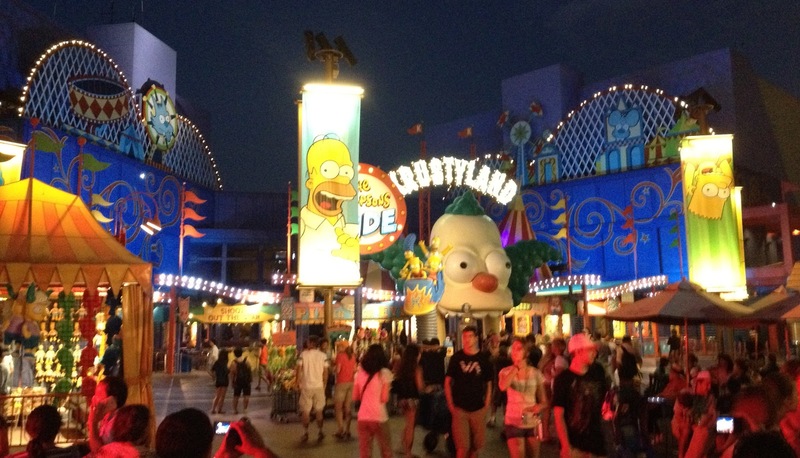 The next day, we drove to Universal Studios in Hollywood. 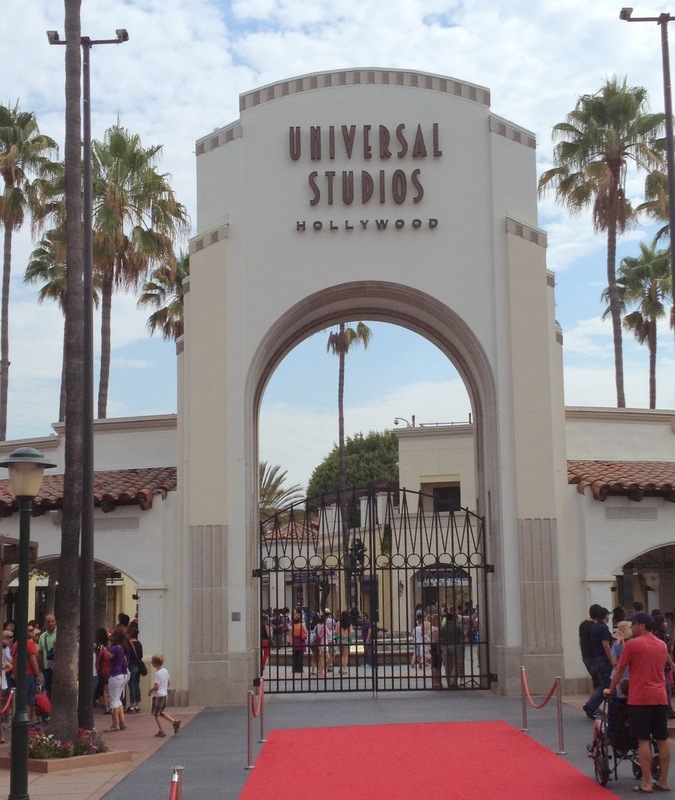 The production company behind classics like Jaws, Psycho and Jurassic Park runs an hour-long studio tour that's included in the price of admission to the attached theme park. We took in the amazingly realistic Transformers 3-D ride (a couple times, actually) and Revenge of the Mummy roller coaster before going on the tour. Among the many highlights of the tour was the King Kong 3-D motion simulator, which made us feel like we were trapped amid a jungle battle between the famous gorilla and a horde of dinosaurs. We also got to see Doc's DeLorean from Back to the Future, the Wisteria Lane exterior set from Desperate Housewives, and the War of the Worlds plane crash scene. We broke for lunch at one of the CityWalk restaurants, Wolfgang Puck Bistro, where our older son amazingly ordered from the kids' menu for the first time in years. That said, he got two orders of salmon skewers with green beans. In the afternoon, we conquered the upper level of the park, where we entered multiple dimensions at Shrek 4-D, Terminator 2:3-D and The Simpsons Ride. The best attraction there was Waterworld, a 20-minute live-action rescue adventure featuring lots of stunts and special effects. The Flintstones BBQ stand was among the concessions listed on the park's gluten-free dining guide, so my son ordered the BBQ chicken platter, which came with sides of baked potato and cole slaw. The boys chased dinner with Ben and Jerry's vanilla soft serve. With three theme-park days under our belts, we opted to leave the driving to others the next day. We took a 6-1/2 hour guided tour of Los Angeles. The tour took us through several neighborhoods where some of Hollywood's famous make their homes, including Bill Cosby, Steven Spielberg, Tom Cruise, Jack Black, Will Smith and Jackie Chan. We saw famous sites like Rodeo Drive, Paramount Studios and the Hollywood Walk of Fame (where I got to see the star awarded a few years ago to my favorite band, Canadian rockers Rush). This tour, like many others, stops for lunch at the Original Farmers' Market. There's a stand there that serves gluten-free pizza, but we weren't comfortable with the preparation. We weren't able to find any other accommodating vendors, so I ended up taking my son to a nearby Chipotle for a rice bowl. As it turned out, we were only a few blocks from fonuts and had time to spare, so we walked over to the shop. 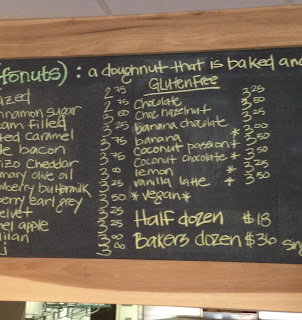 We were amazed to see so many varieties of gluten-free donuts. My son devoured the coconut passion fruit donut before we left, and so I ended up buying another flavor - chocolate hazelnut - for his breakfast the next morning. We stopped for dinner before returning to the hotel at the Santa Monica location of Buddha's Belly. 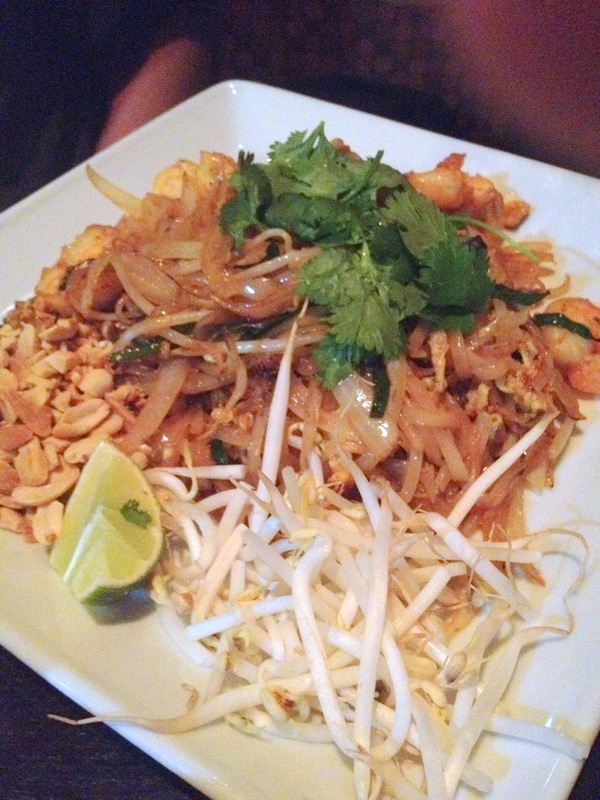 With a large gluten-free menu to choose from, we ordered family style and shared shrimp dumplings, pad thai, fried rice and peanut noodles. I was nervous heading into the vacation that nine days was too long of a trip, but there was so much to do in southern California that the time flew by. With just a couple of exceptions and a bit of planning, it was extremely easy to find gluten-free options throughout the region. 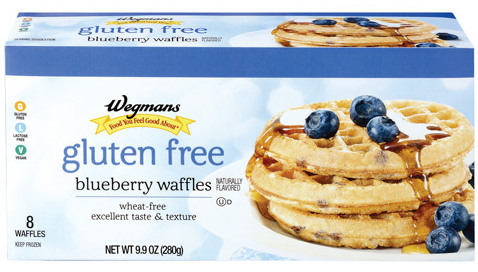 Finally, there's a breakthrough on gluten-free breakfast foods in the area. New Wave Cafe, a gastropub in the Queen Village section of Philadelphia (784 S. 3rd St., 215-922-8484), now offers pancakes and waffles at brunch on Saturdays and Sundays. (The waffles are made in a dedicated iron.) Pizza is available daily, and the kitchen is looking to source gluten-free buns and rolls. Dogfish Head's Tweason'ale is on the beer list. All Uncle Bill's Pancake House locations now have gluten-free pancakes. The outposts in Avalon (3189 Dune Drive, 609-967-8448), North Cape May (3820 Bayshore Rd., 609-886-0066) and at 21st Street in Ocean City (2112 Asbury Ave., 609-398-7393) are open all year. The seasonal locations are in Cape May, Ocean City (at 40th Street), Stone Harbor, Strathmere and Wildwood. Underdogs has opened a second location, in South Philly's Italian Market (1205 S. 9th St., 215-551-8080). Gluten-free buns are available and the fries are cooked separately. My son and I had a terrific dinner this week at Table 31, the Italian steakhouse inside Philadelphia's tallest building, the Comcast Center (1701 JFK Blvd., 215-567-7111). The new gluten-free menu doesn't list them, but there are a number of pastas available daily. I recommend the spaghetti bolognese, lobster rigatoni or (if it's a special) the short ribs with creamy polenta. 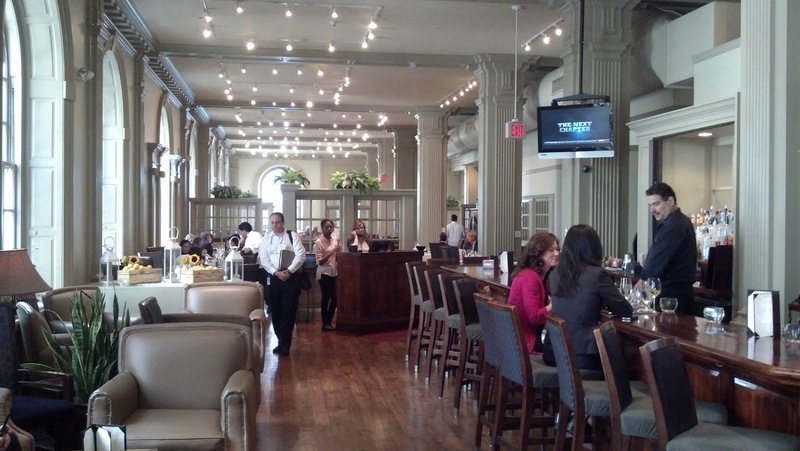 Center City's Garces Trading Company (1111 Locust St., 215-574-1099) now has a formal gluten-free menu. Links to current gluten-free menus at Chef Garces' other Philadelphia restaurants (Tinto, Amada, Distrito and Chifa) are at my Restaurants page. The Springfield location of Cocco's Pizza (35 E. Woodland Ave., 610-544-6730) has joined those in Downingtown and Primos in serving gluten-free pizza. What's more, the Downingtown spot is also selling hot pretzels from Tonya's Gluten Free. 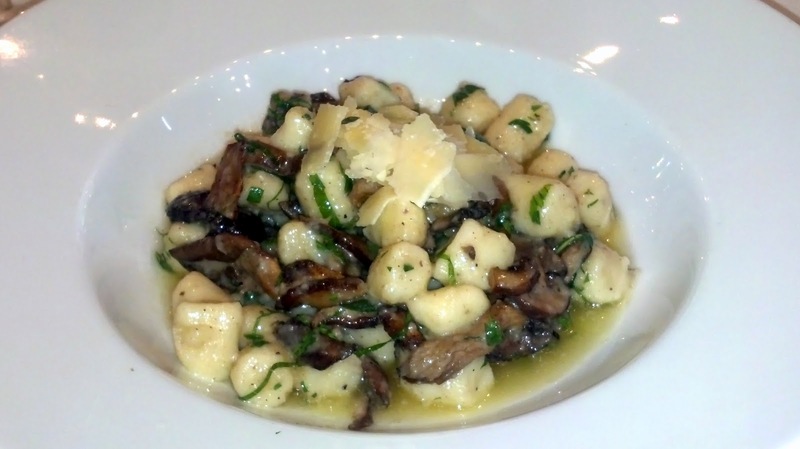 Earlier in the week, I posted a review of another Center City Italian steakhouse, Davio's. Coincidentally, the restaurant is offering a three-course gluten-free beer dinner menu next week (October 22-28) featuring Redbridge beer and Magners cider for $50 per diner, not including tax and gratuity. Philadelphia's first The Lite Choice, which I wrote about last month, will open for business tomorrow at 135 South Street. The chain's signature soft serve is gluten free and gluten-free cones will be available. Congratulations to this year's winners in the Gluten-Free Beer category at the 2012 Great American Beer Festival. Rock Bottom Brewery in Arlington, Virginia took the Gold with Nikki's Gluten-Free Pale Ale, Colorado's New Planet Beer won Silver with a limited Brown Ale release, and Harvester Brewing in Portland captured the Bronze medal with its Pale Ale. The Celiac Diagnostic Center at Atlantic Gastroenterology in Egg Harbor Township (3205 Fire Rd., 609-407-1220 x1125) is hosting a support group meeting on Tuesday, October 30 at 7 p.m. Somers Point ShopRite dietitian Amanda Fischer will be the guest speaker. An online petition to the White House seeks to have the government finalize gluten-free food labeling, which was supposed to have been done back in 2008. If the petition garners 25,000 signatures by November 1, the government will respond. More signatures are needed, so sign it through this link. Vote for Gluten Free Philly as Best Support Group in the GFREEK.com Best of Gluten-Free Philadelphia Awards. Contributor Alice Ozma is a young professional in the publishing industry who works from her home in Old City. She was diagnosed with celiac disease a year ago but also has problems with everything from dairy to fresh fruits and vegetables, which makes life… interesting. Although the high ceilings, tall chairs, and business suits at Davio’s initially made me feel awkward, I felt at home when the hostess handed me and my roommate extensive gluten-free menus. I came to the Center City Italian steakhouse (117 S. 17th St., 215-563-4810) to try the pumpkin gnocchi but didn’t call ahead and, unfortunately, it wasn’t in yet. The manager came over to apologize and took my card; when I arrived home an email awaited me, including details about the gnocchi and even the recipe. Impressive. Our lunch started with a shared basket of bread (for my non-celiac roommate) and potato chips cooked in a dedicated fryer. I mentioned to the server that I couldn't eat the chips since some had touched the bread, so he removed the basket and started from scratch with fresh orders in separate baskets. The chips would have tasted better warm – some were crispy, most a bit soft and oily – but I was happy to have a non-bread option. We ordered figs with gorgonzola and micro greens in a port wine syrup as our appetizer, gnocchi with mushrooms and truffle oil (not on the menu but our server’s suggestion) for me, and the pasta with applewood smoked chicken, spinach, and sun-dried tomatoes in walnut cream for him - all gluten free. After 20 minutes, our tiny appetizer arrived –four or five figs. It was, however, quite tasty – the cheese balanced the sweet figs,, the greens were fresh, and it was just warm enough to enhance the flavor. After a pause before our entrees, the manager reemerged to explain the special steps the kitchen took to prepare them gluten free, including boiling our own water. The hearty gnocchi (my roommate noticed slight graininess, though I did not) was complemented nicely by the oil and mushrooms, making it feel deceptively light and airy. His brown-rice pasta held its shape and soaked up the salty yet silky smooth sauce; he remarked that he wouldn’t have known it was gluten free. The smoked chicken, too, was incredibly flavorful. While both dishes were a bit heavy on the pepper, overall we loved them. Paired with an appetizer or dessert, the portions were spot-on. 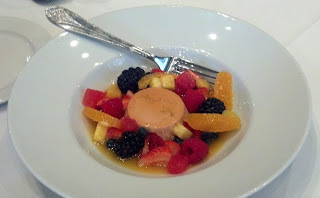 We followed those dishes with a zesty panna cotta served with fruit, which was so aromatic we smelled it coming. As tropical flavor fans, we loved the pool of flavorful juice at the bottom of the plate. It was wonderfully tangy, and my roommate correctly detected a hint of passionfruit. The panna cotta itself was merely a sponge for this fruity goodness, but it served its purpose well. Shortly after putting our spoons down we were surprised with warm, gluten-free chocolate cookies, which were the highlight of the meal. They were fluffy and so darkly chocolatey, I couldn’t eat them without sighing. Our server assured me the cookies were available “to-go,” and I’d definitely pick some up for a party or just to scarf down two at a time on the subway. The bill was the only unpleasantry, totaling $57 before tax and tip. This might have been easier to swallow if the small portion of figs had not cost $13 – and we did not know this, as it was the special. We were full to bursting by the end of the meal, though, so if we returned, I’d skip appetizers. For me, the prices are somewhat inhibitive for lunch, but I’d certainly go for a special occasion, where I could dress up. It’s better suited for that anyway. C19 (267 S. 19th St., 215-545-0441) has brought Venice to Rittenhouse Square. Not only does the kitchen prepare gluten-free pasta, but also salads, risotto, steaks, fish entrees and even pan-fried polenta frites. Lots of new options in suburbia this week. In Chester Springs, Liberty Union Bar & Grill (325 Simpson Dr., 484-359-4061) has a gluten-free menu as well as Redbridge beer and Woodchuck cider. The wings and fries are prepared separately. Villanova's Azie on Main (789 E. Lancaster Ave., 610-527-5700) has a gluten-free menu that features pad thai, fried rice and sashimi. In nearby Wayne, many selections at the vegan-friendly Raw Can Roll Cafe (767 W. Lancaster Ave., 484-580-8454) are gluten free. Red Robin has a targeted opening time frame as the "beginning of 2013" for its Deptford Mall location. The chain has gluten-free burger buns and fries. Baked goods from "Best of Philly" winner The Little Bakery are now sold in Center City at Brodo (31 S. 18th St., 215-977-7766) and Rittenhouse Market (1733 Spruce St., 215-985-5930). Look for Perdue's new gluten-free and dairy-free refrigerated breaded chicken tenders in supermarkets, as I wrote on Tuesday. The Somers Point ShopRite (Rt. 9 & Bethel Rd., 609-927-8133) will be having a gluten-free festival on Saturday, October 20 from 9 a.m. to 3 p.m. They'll have samples, coupons, and information available as well as a chance to win $50 worth of gluten-free items. Make note of a fundraiser at the newest Iron Hill Brewery location, in the Chestnut Hill section of Philadelphia (8400 Germantown Ave., 215-948-5600). Present the special voucher at dinner on Monday, November 12 and the restaurant will donate 20% of your food bill to the National Foundation for Celiac Awareness. Iron Hill has extensive gluten-free menus for adults and kids.